VATICAN CITY (CNS) — When shopping and when interacting with people on city streets, everyone can help fight the evil of modern-day slavery, Pope Francis said in his annual message for the World Day of Peace Jan. 1. The pope’s message was released Dec. 10 at a Vatican news conference led by Cardinal Peter Turkson, president of the Pontifical Council for Justice and Peace. The pope called for personal responsibility, grass-roots action and international cooperation to combat the new and growing forms of “this abominable phenomenon” of human exploitation. Make an effort to “feel challenged when, in our daily lives, we meet or deal with persons who could be victims of human trafficking, or when we are tempted to select items which may well have been produced by exploiting others,” he said. Instead of closing one’s eyes to this tragedy, “do something about it,” he said, by joining an association or “offering a kind word, a greeting or a smile” that may give hope or change the life of someone who might be a victim of exploitation. 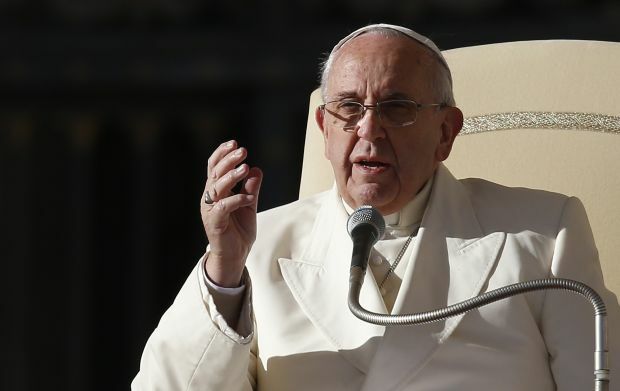 Praying for an end to all wars, conflicts and suffering caused by natural disasters and disease, Pope Francis said his thoughts were with the many men, women and children in the world who have been robbed of their freedom and human dignity. “I think also of the living conditions of many migrants who, in their dramatic odyssey, experience hunger, are deprived of freedom, robbed of their possessions or undergo physical and sexual abuse,” he said, denouncing the sometimes “inhumane conditions” migrants face when they are detained by authorities. While many find themselves working illegally or living clandestinely, others, in an attempt to act within the law, may “agree to disgraceful living and working conditions, especially in those cases where the laws of a nation create or permit a structural dependency of migrant workers on their employers, as, for example, when the legality of their residency is made dependent on their labor contract,” he said. The pope made special mention of the world’s congregations of women religious, who are especially active in “enormous and often silent efforts” to help victims. “This immense task, which calls for courage, patience and perseverance, deserves the appreciation of the whole church and society. Yet, of itself, it is not sufficient to end the scourge of the exploitation of human persons,” the pope said. Local, national and international governmental organizations must commit themselves to “prevention, to victim protection and to the legal prosecution of perpetrators,” he said. Cooperation between governments, organizations and “the world of finance” is needed to fight organized crime, which orchestrates human trafficking and the illegal trafficking of migrants, he said. Businesses must “ensure dignified working conditions and adequate salaries for their employees, but they must also be vigilant that forms of subjugation or human trafficking do not find their way into the distribution chain. Today’s “culture of enslavement” and “the globalization of indifference” must be countered with a fresh recognition that everyone belongs to one human family and “a new worldwide solidarity and fraternity capable of giving (victims) new hope and helping them to advance with courage,” he said. St. Josephine Bakhita, the former Sudanese slave, is “an exemplary witness of hope for the many victims of slavery” today, the pope said. The first International Day of Prayer and Awareness against Human Trafficking will be marked Feb. 8, St. Josephine’s feast day. The new observance is being promoted for all dioceses, parishes and church groups by the council for migrants, the Pontifical Council for Justice and Peace and the international unions of superiors general of men’s and women’s religious orders.